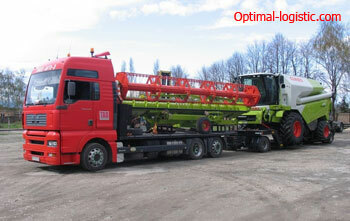 Optimal Logistic Company provides transportation of agricultural machines and attachments. At the same time, such orders are very difficult from a technical point of view. So, harrow transportation requires the use of special freight transport and accurate calculation of the route. Reliable harrow locking and speed compliance guarantee safe harrow delivery. The company provides deliveries within the agreed period. In this case, the equipment will not be damaged. Moving of the named equipment is often required not only in Ukraine, but also in other countries. Therefore, the company is ready to assume the forwarding tasks, the provision and completion of customs documents when crossing the state border. In general, the transportation of harrows is carried out in Europe, Central Asia and inside Ukraine. Before executing the order, the specialists calculate the cost of delivery, which remains unchanged for the customer. The price of the services includes fuel costs, customs fees. In addition, the calculation of the cost includes also the price for freight forwarding.